Wine Tasting Notes – Page 2 – GARGANTUAN WINE. Sunny Stony Hill Vineyards. Photo: Alexander Rubin. Confessions: first, I’m usually drinking European wines, where dry farming is the law. And I’ve been pretty brutal to Napa Valley’s wine. The unholy alliance of high alcohol, high points, glamour marketing, and bombastic fruit profiles — the preferred drink of heavy-handed cologne wearers, whose senses are all but dead to the world — is the exact opposite of everything I’m looking for in a wine. I’ve noted this strange correlation firsthand while working in wine retail. Often, drinkers and peddlers of bombastic, fruity wines are a suit-clad social elite, slathered in an ungodly amount of cologne, obsessed with how many points a wine scores. 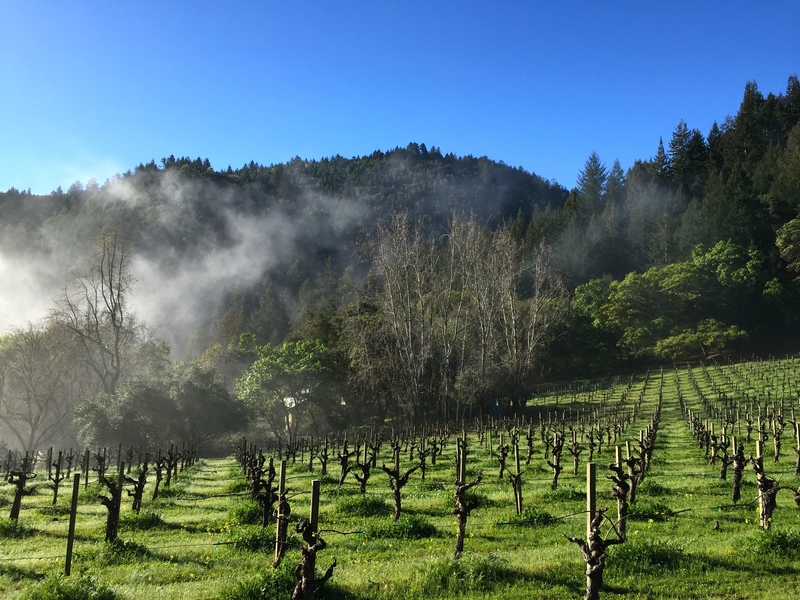 These are the sellers and consumers of what we’ll call Big Fruit: Amarone, pricey Super Tuscans, post-2000 vintage Bordeaux, and of course, pricey Napa Valley reds. But not all Napa Valley reds are built alike. Robola is often touted as Greece’s second noblest white grape1, forever trailing on the coattails of Assyrtiko. If Assyrtiko has a greater footprint in consumers’ minds, it’s in part due to the crushing influx of tourists to Santorini and the enduring affective link they build while traveling in Greece. But Robola remains a total mystery to the rest of the world: no one seems to have heard of it outside of Greek industry tastings. And unsurprisingly, no one has heard of its home: the stunning Ionian island of Cephalonia itself. Only Italian and English tourists seem to have discovered the Cephalonian secret. Historically, they’ve an unfair advantage, as the Venetians and later the English ‘protected’ the island after the Turks lost control in 1460. Poor Robola. No one speaks of this silver medalist, this silent prince, who lives in the shadow of its Santorinian counterpart. Or — more precisely — who lives in the shadow of Mount Ainos. Mount Ainos, the darkest peak, with typical clouds nearby. The limestone suddenly turns to Cephalonian pine on the opposite side of the peak. Wild horses roam the slopes of Mount Ainos. Courtesy gballuk, Panoramio. View from the top of Mount Ainos. Courtesy Anthony Leather, Flickr. The Robola grape grows on the slopes of this highest peak of Cephalonia (also spelled Kefalonia). A fair share (10-30%) of these are ungrafted vines, over 100 years old, planted at up to 2600 ft (800 m). Which is to say: this is the real deal. Here is a unique wine expressing Cephalonia’s limestone terroir in the most raw, direct form possible. 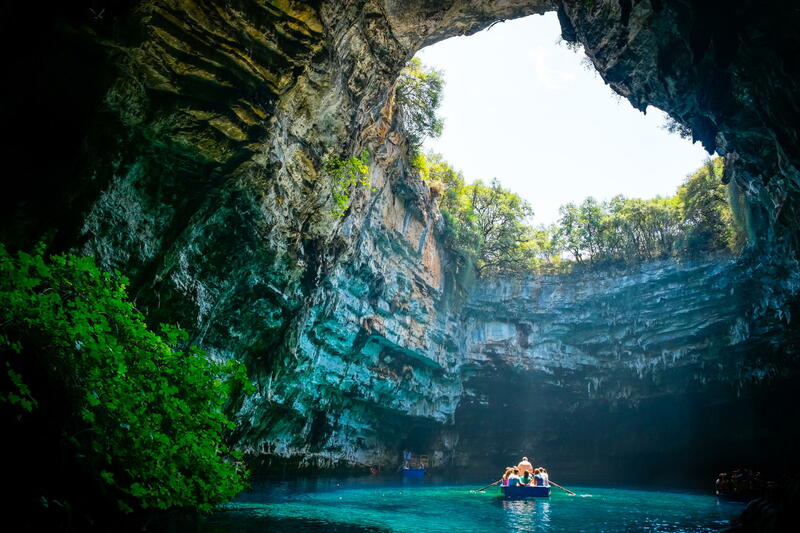 Cephalonia is a shimmering, turquoise-watered island paradise; yet another otherworldly, karstic limestone world in Greece, whose crown jewel is the Melissani cave. THE ZAGORI region of Greece has only very recently become a hot “alternative” tourist destination — in part since it became a UNESCO protected geopark in 2010. The Zagori highlands, located within the Pindus mountain range in the larger Greek region of Epirus, are for the most part abandoned, shockingly steep, infertile lands. 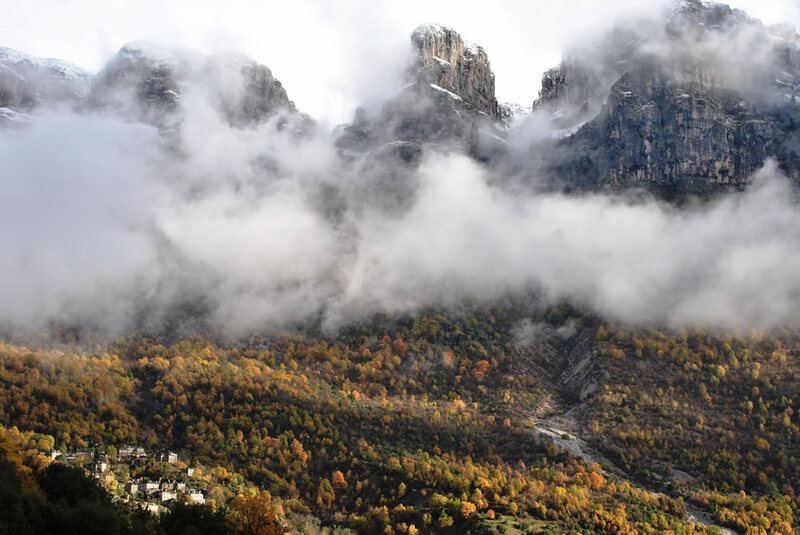 As is the case with most of Greece, the Zagori’s beauty stems from its karst landscape; that is to say, a limestone landscape which has been eroded by groundwater. 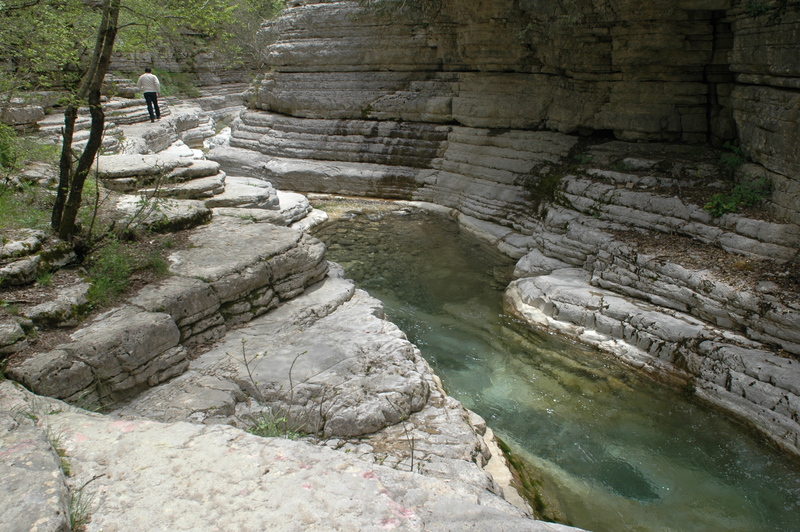 Natural pools near Papingo, Vikos–Aoös Natural Park.